Another Draft Environmental Impact Report, another threat to trees. Now we’re no longer counting in thousands or tens of thousands. This time, it’s hundreds of thousands. 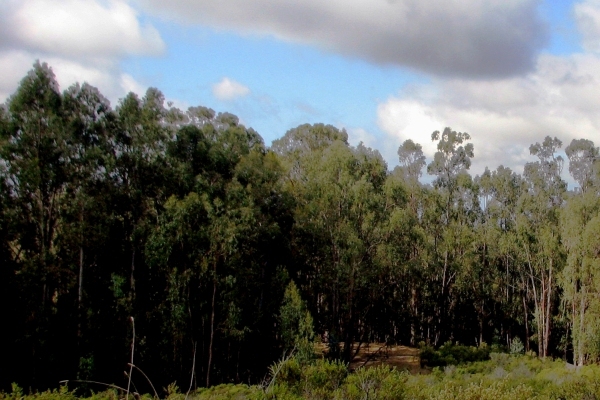 In the East Bay, there are three inter-related plans to cut down nearly 500 thousand eucalyptus and other trees on nearly 1500 acres of land. East Bay Regional Parks District (409,000 trees on 1,060 acres). They would use Garlon to prevent resprouting (which would require thousands of gallons of this very toxic herbicide), and glyphosate (Aquamaster or Roundup) to discourage the growth of non-native plants. The first two projects plan to remove all the non-native trees in the project areas. The third plans to “thin” the trees to about 60 trees per acre, removing around 90% of the trees on the project area, and using prescribed burns in addition to pesticide. You can read about this plan and the tree removal calculations HERE. The plan is described as ‘fuel reduction’ to lessen the fire hazard. In fact, is likely to have the opposite effect. Wind speeds will rise since the wind breaks provided by the trees would be gone. With the trees and shade gone, finer fuels like grasses and shrubs will grow instead. The loss of shade and the moisture harvested from the fog will make for a drier, more fire-prone landscape. The felled trees will be left in place, contributing dead wood to the fuel load. The plans intend to encourage the growth of native plants – but doesn’t provide for planting or tending them. They assume that the existing seed banks and seeds from adjacent areas will grow there. Actually, it’s more likely that blackberry and broom and other fast-growing non-native species will take over. If some of this acreage does become oak-bay woodlands, as the land managers hope, there’s another problem: Sudden oak death, which is spreading through California and could provide dead trees as fuel. The Plan will be a blight on the environment. The trees will no longer store carbon; instead, they will be releasing thousands of tons of it into the atmosphere. Thousands of gallons of toxic herbicides will be spread over the East Bay. Prescribed burns will further affect air quality, and could get away and cause wildfires and serious damage. Erosion and landslides could occur on steep slopes when the tree roots no longer stabilize the slopes. The plan is to fund the first two projects, and about a third of the East Bay RPD project, from FEMA grants. This takes money that’s needed to respond to or avert actual serious disasters and uses it for a doomed Native Plant conversion project. Sign a Petition. The Hills Conservation Network has a petition up; the button will take you to the petition. Contribute. Hills Conservation Network are also raising funds for potential legal action. If you would like to contribute, their website is HERE and includes a Paypal button. Speak at public meetings. FEMA will host three public meetings in Oakland, and taking public comments. Two are on May 14, 2013 (at 2 p.m. and 6 p.m.) at the Richard C. Trudeau Center, 11500 Skyline Boulevard Oakland, CA 94619. One is on May 18, 2013 (at 10 a.m.) at Claremont Middle School, 5750 College Avenue Oakland, CA 94618. The EIS is a good one. It will lessen the risk of damage that happened in 1991 when about 25 people died and there was more than 2 billion dollars in damage. The opponents are exaggerating the environmental effects. The result of the work would make the area more beautiful than ever. [Webmaster: Thanks for commenting! We’re concerned with saving lives, too, as are others. We just don’t believe these Plans will actually do that. You are not proposing a solution that will be funding. By delaying you are putting lives at risk. The plan might not be exactly what you want, but it is a good plan and will get things done. We need action before more humans are killed. I actually haven’t seen anything credible on these advocacy sites that actually credibly – using empirical evidence – that shows in a reality-based way how this is “the wrong thing”. Just saying. We’re not sure what empirical evidence you need. Would it help to know that fires typically start in brush and grassland, and those fires move faster? Or that live eucalyptus isn’t particularly flammable? Any empirical evidence that shows grass fires are more severe than eucalypt fires, grass and brush have more fuel than eucalypt stands, and so on. [Webmaster: Right, but that wouldn’t be the point, would it? The objective of the fire mitigation is to prevent fires that will affect homes and other structures. The homes themselves are more flammable than trees, and so is grass and scrubland. We’re linking a New York Times picture that demonstrates this point. The danger is that there will be more frequent fires once the trees are removed, and that the fires will be a greater threat to homes. [Webmaster: Because “gasoline trees” is an epithet that conveys prejudice and misinformation? Because eucalyptus isn’t more flammable than any other tree? Because the replacement vegetation will be *more* flammable than the forested areas? Who could *support* it if they had all the facts?